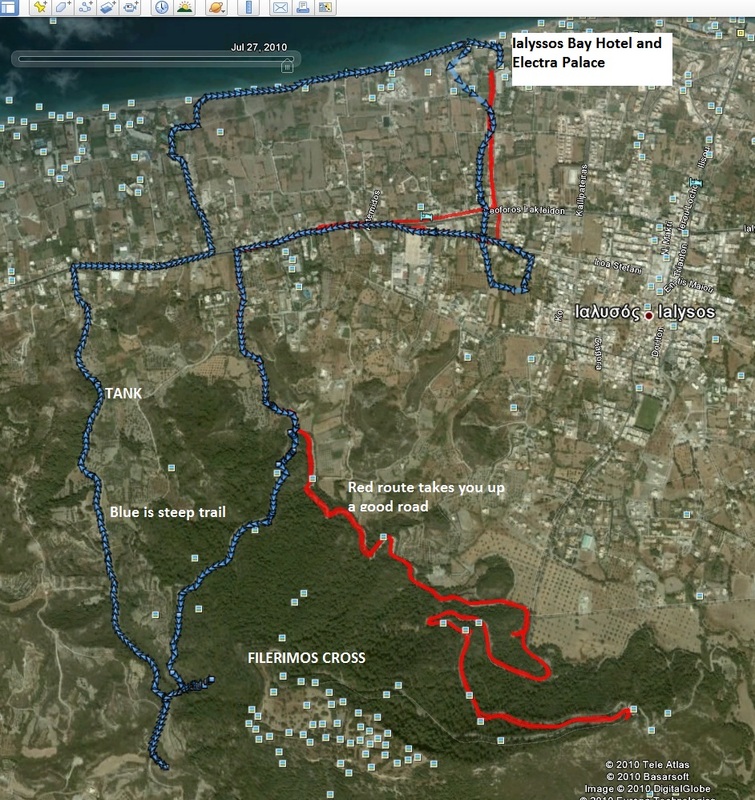 The following runs are from the Electra Palace or Ialyssos Bay Hotels in Ialyssos. First I tried running on the beach in the morning. This was very hard work because the surface was difficult (sand and pebbles) and direct sun made it very hot. A better route was to head South, away from the sea, to Filerimos Mountain for an evening run. This route was mostly shaded and there are two options shown below, both about 7-8 miles. Follow the path up into the forest. If you just follow the path (RED ROUTE BELOW) it takes you down and past a cemetery. on a zig zagy route. Eventually you reach the top of Filerimos Mountain. In my red trace below I stopped before reaching the top as I didn't know the road was going to the cross. missing out the cemetery (BLUE ROUTE), it takes you up and back down, eventually passing a tank and to the beach.